Have a Front Row Seat at Rev. Ike's Famous Seminar – In Your Own Living room! Are you interested in having plenty of money and prosperity? Then Rev. Ike's dynamic and entertaining "How to Beat Being Broke" Audio seminar (available on 2 MP3s) is the right place for you! (The video sample is a brief excerpt from this audio) Listening and participating in this interactive, almost 2-hour workshop with Rev. 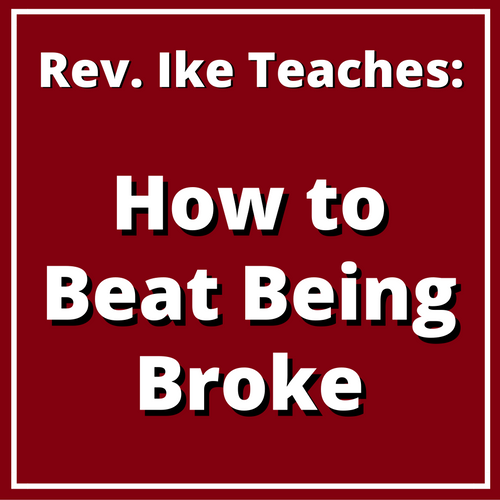 Ike, is like having a front-row seat at his live seminar – even better, because you have Rev. Ike with you, to listen to again and again – to these ideas that will transform your consciousness – and enable you to manifest the life that you want! Beat Negative Thinking Right Out of Your Consciousness! During this entertaining, humor-filled audio, Rev. Ike reveals his secrets and techniques for creating the happiness, success and prosperity that is your God-given right! You'll Interact with Rev. Ike and Enjoy this Exciting Experience! Throughout this up-lifting experience, you'll interact with Rev. Ike – and 'Get the Feeling' as you repeat with him powerful affirmations that will clear your subconscious mind of negative beliefs and attitudes – and implant new Positive beliefs in your consciousness! Listen and participate in this Voyage of Self-Discovery! You'll examine yourself and uncover your "Financial Psychology"
You'll discover how your attitude affects your results – and how to get it right! You'll get rid of your “Money Rejections Complex” – your beliefs that can kick money away from you! Everything is a Condition of Your Mind! Rev. Ike teaches us that everything is a condition of the mind. The idea comes first and then the manifestation of that idea. You can’t be, do, or have anything until you first have the idea of it in your mind. That’s why this joyful work that you do with Rev. Ike during this seminar is so important! Rev. Ike leads you through his powerful Affirmative Prayer for Success and Prosperity! You'll repeat an affirmation to rid your mind of the 'N-word' of money. You'll participate in Rev. 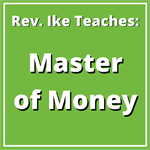 Ike's Money Prayer to program your mind for Money! An Inspiring, Motivating and FUN Experience! Rev. 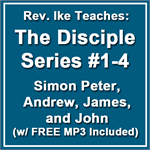 Ike delivers this dynamic 2-MP3 workshop with his usual wit and humor (he even tells a few jokes), as he teaches, coaches you, inspires and motivates you! You'll want to own this dynamic audio so you can have Rev. Ike with you to listen to again and again, whenever you wish! Total length: 1 hour 52 minutes.